"Arnott’s genius – and genius it is – is to reawaken and channel this material into his own rendering of our history..."
Elizabeth Lyon is headed for The Tyburn Tree, the last act in a scandalous life in 1720s London. Before she is sentenced, she tells her story to a young Grub Street scribe, Billy Archer. Her journey begins in the genteel surroundings of Edgworth, where as a servant girl at a country house she had her fatal first dalliance with the young master. Dismissed in disgrace, she makes her way to the streets of Covent Garden and St Giles known to its inhabitants as Romeville. Here she learns the ways of the 'flash' world from cross-dressing prostitute, Punk Alice, and catches the eye of the Thief-taker General, Jonathan Wild. Wild bestows favours on the girl he calls Edgworth Bess, but there is a price to pay for each one – as she will discover when highwayman Jack Sheppard makes off with her heart. A price known only too well to her biographer Billy, who has his own secret life amid the Molly Houses of the Hundreds of Drury. 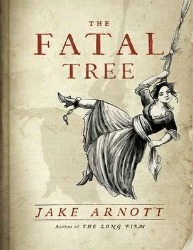 Based on the true stories of Elizabeth Lyon, Jonathan Wild and Jack Sheppard, and rendered in the mesmerising slang known as St Giles Greek, 'The Fatal Tree' brings alive the teeming streets of early 18th century London as vividly as the contemporaneous etchings of William Hogarth. Though separated by centuries, it is a place that has many parallels to our own — bankers spinning fortunes on the South Sea Island bubble, politicians looking after their own when it bursts, a populist press selling scandal direct from the gates of Newgate Prison and a public who take their pleasures in the 'vaulting academies' of Covent Garden and under the shadow of the noose. A Capital city of immigrants and outcasts, all crammed in together like rats and ruled over by one-man police force Jonathan Wild, whose methods of enforcing order are more akin to those of a gang boss. There are further similarities between Wild and Harry Starks, the mythical gangster who first made Jake Arnott famous in 1999's 'The Long Firm', his reimagining of the Kray twins, Joe Meek and clandestine Sixties London. There are further echoes of Stark's boyfriend Harry in Billy, and his closest friend, aspiring actress Ruby Ryder in Edgworth Bess. But then, that story began with a line from Bertolt Brecht and Kurt Weill's 'The Threepenny Opera', that still resonates loudly today: 'What's breaking into a bank compared with founding one?' Brecht in turn spun his work from that of another character who appears in these pages, the poet and satirist John Gay, who collects the material for his 'Newgate Pastoral' 'The Beggar's Opera' with the help of Billy Archer. Arnott's genius – and genius it is – is to reawaken and channel this material into his own rendering of our history with such magical dexterity that, by the time you tear yourself away from the final page, you will believe that you have really journeyed with him back into the flash world, leaving the flat one far behind.